The Uyghur people are renowned for their skill at processing gold, gemstones, silk, and leather wares. Among all of these glittering jewels, the most prized are the knives of Yengisar. Yengisar is a small town in Yengisar County of Xinjiang that has been manufacturing handcrafted knives for over 400 years. There are over 20 different types of Yengisar knife that come in around 40 diverse designs. They can range from small pocket knives to formidably large swords. In short, they’re not the kind of knife you’d keep in a kitchen drawer! The hilt is typically carved with a myriad of intricate patterns, while the blade is made of stainless steel and the cutting edge is notoriously sharp. 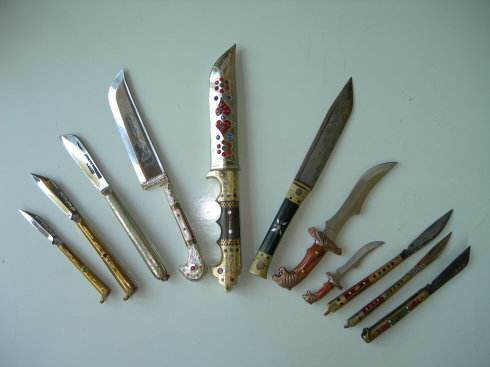 For men, carrying a knife is a major part of Uyghur culture and these spectacular knives are a symbol of the wearer’s masculinity.